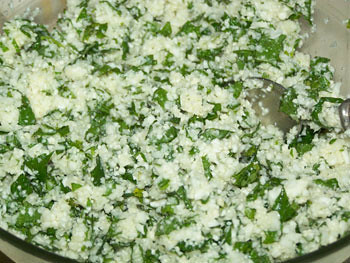 If you like raw cauliflower and fresh mint, I recommend you try this dish! Jim and KDcat don't like raw cauliflower much, so this dish wasn't a big hit with them. I, however, consumed the entire dish before the end of the day! I LOVED it! Directions: Finely grind (pulse) the cauliflower until it is in tiny pieces, but stop processing before it turns into a paste. 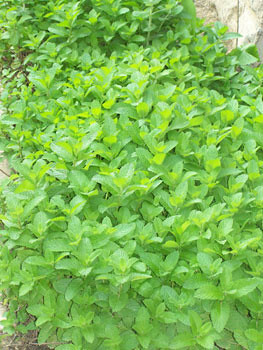 Pick some fresh mint, if you have any growing in your yard. If you don't, and you enjoy mint, then I recommend growing some! It's easy to grow and smells wonderful. You'll want to plant it in an area that is confined, however, or else it takes over. Here's a picture of the mint growing on the side of our home. 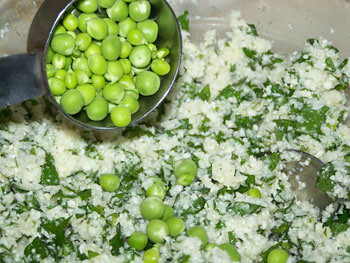 Next, mix the spearmint, loveage, olive oil, salt, cilantro, and lemon juice with the cauliflower. Then add the optional peas, if you have any. 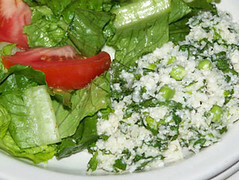 I LOVED the peas in this dish! I served this dish with a simple side salad that didn't have much more on it than a tiny bit of salt, oil, and lemon (and some chopped tomatoes). This refreshing cauliflower mint salad is very flavorful, so you'll want to eat it with something plain. This dish is best eaten as soon as it is prepared. When it is freshly prepared, it is light and fluffy. The longer it sits, the softer the cauliflower gets and the overall dish becomes a bit watery. It still tastes great, but the texture isn't the same. I like cauliflower, but haven't actually tried fresh mint! I'll have to try out the combo sometime. Oh and where do you get freshly shelled peas from...your garden? Can I be really stupid and ask you to show me a photo of waht they look like unshelled and what they're called? 'Cos my hubby and kids love peas but I've never found any fresh ones. This sounds so fresh and delicious! Your pictures are wonderful and have most of the ingredients growing in my own back yard...YAY! I am always thrilled to get a new, fun recipe! It looks like tabouleh, which I've missed cuz of the wheat in it. I'm going to give this a try. Thanks!